Who else loves a good tub soak after the kids are in bed? I’m not a mom, but have always enjoyed a good bath soak after a long day, week or even on a bitter cold evening. 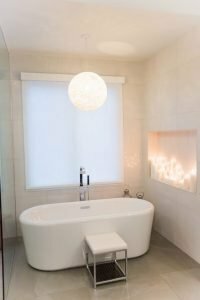 If you have been pondering the idea of replacing your current tub, beginning a bath renovation or even gathering ideas for your new home build, take a look at some of these go-to soaking tubs! Without a doubt, freestanding tubs are the look! 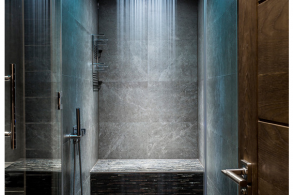 The idea of incorporating a tub within the shower area keeps the moisture in a contained location and could be awesome for even bath/shower time with the little ones! Looking for the dreamiest, most relaxing setting for a tub? What better place than in front of a fire place?! Although not practical for most of us, this truly takes luxurious possibilities to another level. 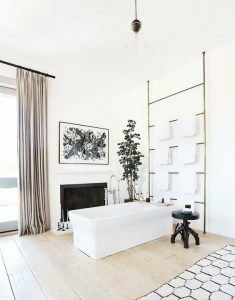 By incorporating a rug, accent table, soft lighting and even some greenery, you too can make a relaxing bath oasis similar to this in your home! I adore this bath renovation by ACo. The space incorporates the best of both worlds for you and your family where practicality meets function. From the water-proof wall niche, romantic lighting and stool for bathing ease, this bathroom is a natural go-to place for bath time or that hour of silence at the end of a long day. Are you ready to create a luxurious and rejuvenating bath experience in your home? ACo is ready to help! Start gathering your inspiration images and visit the ACo website at https://liveaco.com or give them a call to schedule your appointment at 317.575.9540.